Ipswich Bay 18 "Peggy Bliss"
Banks Dory similar to "Centennial"
Dan Noyes is an accomplished Wooden BoatBuilder on the North Shore of Massachusetts. Following in a family tradition of boatbuilding, Dan practices his craft in Newbury, Massachusetts. Dan showed off a new Banks Dory he made for Chris Farris. Chris rows about 150 days of the year, and wanted a sturdy boat to take on his adventures. Dan and Chris settled on a slightly modified version of the famous banks dory "Centennial." They shortened the overall length by about 2 feet and the overall width by a few inches. -Dan showed off the Alpha Dory "Spear" at this year's Wooden Boat Show. "Thank you" to all the fans who joined us in Mystic, CT to check out this 100 year old Chamberlain design! While the Alpha on display belongs to our friend Doug now, Dan is ready to build another. Contact Dan if you're interested in your own racing dory. -Dan helped friend Brendan show off the English-style Duck Punt that Brendan built under Dan's tutelage. Brendan's fabulous boat, which thanks to exquisite design sails beautifully without rudder or centerboard, was on display both in the "I Built It Myself" area and on the water. Great job, Brendan! Summer 2009: Dan repaired a Beetlecat, a Lowell's Dory Skiff and some masts. He went to the Small Reach Regatta in Maine this July with Alpha-Beachcomber dory. September 2008: Videos posted on YouTube and Wooden Boat Videos of the Alpha Dory "Spear" sailing in Newbury, MA. August 2008: Dan and Joel have finished the Alpha Dory "Spear" and showed her off at three boating events: Small Reach Regatta (ME), Antique and Classic Boats Festival (MA), and Gloucester Schooner Festival/Race (MA). He won award for best hand-powered craft at the Antique and Classic Boats Festival. August 2008: Dan is building an Alpha Dory with his friend Joel Peck. He hopes to have it completed in time for the Small Reach Regatta, August 14-17th, 2008. June 2008: Dan came to the Wooden Boat Show in Mystic, CT again this year. Many people recognized the Ipswich Bay 18 from the article in Wooden Boat magazine's 2008 '"Small Boats" edition. Dan plans on working on this year's Wooden Boat and Professional Boatbuilder Design Challenge! Winter 2007-2008: After the 2007 Wooden Boat Show, Dan Segal came to try out the Ipswich Bay 18, and wrote all about it! Watch for the article in the 2008 "Small Boats" edition of Wooden Boat magazine! Find Dan and his Design on page 90 (pdf). Fall 2007: Bob Hicks of Messing About in Boats published a story Dan wrote about his trip down to the Gloucester Schooner Race/Festival in 2006. See the story here! ... more about Dan's unique 2006 "Schooner Dory" entry! Summer 2007: Dan exhibited his Ipswich Bay 18 design at the 2007 Wooden Boat Show in Mystic, CT. Shortly after the Wooden Boat Show in Mystic, CT, Wooden Boat representatives contacted Dan about running an article about the Ipswich Bay design in their "Small Boats" edition. *Building an Alpha Dory in his barn, giving her a good home with new owner Doug, and showing her off at boat shows. 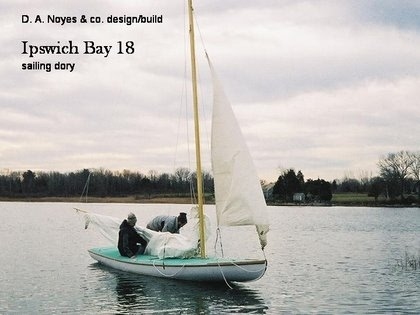 *Designing a new class of sailing dory, building the first Ipswich Bay 18 for a local customer. *Creating oversized Steam-Powered boat models for the New England Model Engineering Society. He exhibited at the February 2007 meeting in Waltham, MA. *Evaluating and Assembling Wooden Dollhouses for a small business owner. *Leading and Implementing a Boat Model Building project at Lowell's Boat Shop as part of a high school entrepreneurship class. Simultaneously, a middle school class worked with Dan at Lowell's to build a Merrimac Skiff. *Showing off the first Alpha Dory, which lives in New Hampshire and Maine with our friend Doug. *Continued development of the Ipswich Bay class, perhaps building another one on speculation in the near future. *Continued work on Steam-powered Wooden Boats and Pop-Pop boat planning. Dan is always available for consulting, restoration, design and construction work. Please contact Dan with any questions, ideas or projects. Click the boxes below to see Dan's photos on Flickr.com!